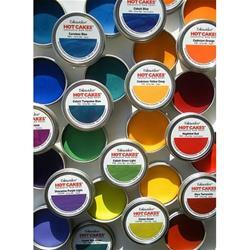 Hot Cakes are ready-to-use professional encaustic paints that come in a convenient reusable metal tin. The artist-quality colors are made from the most beautiful pigments, the finest Damar Resin, and United States Pharmaceutical Grade (USP) Beeswax. These paints contain no bleach or synthetic adulterants whatsoever and the Hot Cake tin design makes the encaustic paints extremely easy to use. Simply unscrew the lid, place the metal tin full of color onto your hot palette, and allow your paint to melt. The tin's flat bottom design ensures that your paint will melt evenly and you can get started right away on your painting. When you are finished, replace the lid on your cooled paint and it will keep your paint both clean and dust-free during storage. The tin's safety rim also makes cleaning the tin very easy and even better, the tin can be reused over and over as it is refillable if you purchase Enkaustikos refills.